Here are some little video clips from a few of our amazing Grade Ones, spontaneously made after an activity with our Word Wall (about which I hope to add a sort of instructional post in the next week–that’s why I was filming). We were having a brief discussion about the usefulness of the word wall and I asked the children, “What have you liked about the word investigations we did this year?” The sound and filming quality are not great–my voice too loud, theirs too faint–so you may need to have fingers on the volume control. Also, you’ll notice many of the children are a bit, er, droopy–it was late in a very hot day. What impressed me though, and what I hope makes an impression on someone else out there, is the clarity and precision of these spontaneous comments from these young students. Making words. Solving word problems. Meaning. Stories in words. Discovering new things. These are very little snippets. But it feels very gratifying to have the children immediately reference these concepts, so central to the work we did with words this year. These are among the tools I believe will carry our able scientists forward in their lifelong exploration of words–or anything else they turn their attention to. Thinking big, indeed! P.S. My unplanned question was sparked by end-of-year blog posts from several other teachers I admire greatly. Click on these links to see the remarks of older students doing similar work in Switzerland, Malaysia and Massachusetts. Collectively, these comments form a massive testimonial to the power of engaging deeply with words. Thank you to these teachers for their ongoing inspiration and encouragement! As we were having a last day chat on the carpet about the remembered events of the year, Madisyn exclaimed, “We need to write to Old Grouch about our words we found!” I confess I’d kind of forgotten, but everyone seemed to agree. The ongoing investigation was not in itself hugely important, save for regularly reinforcing our grasp of various graphemes. What struck me was that the children have never met Old Grouch (my dear friend and mentor), have seen no photo. And yet, his presence in our class was, if somewhat mythological, at the same time real and enduring. So, we sat about on the carpet with my laptop on my knees, wrote the letter together and posted it–quickest post I’ll ever do! And so I will add my own thank you to Monsieur Grouch (wherever he may be…). But the most amazing word we found is the last name of one of our students. (We know that names don’t always follow spelling rules, but they often do). Her lovely last name comes from Cree, one of the native languages of Northern Ontario. It has four digraphs!! Today is the last day of school! Happy holiday! Thank you for helping us to learn with your questions. Happy June! I’ve really slacked off on the blog in the last while! But, it’s report card writing time, which is usually when I do lots of neglected tasks, like cleaning my desk…and my car, and my basement, and my driveway…so, I might as well put in a little time catching up here also. I am not always in control of where our learning goes. In fact, I have come to appreciate the root meaning of learning as “following a track”. I am learning too. A week–a day!–hardly goes by when some question or discovery from the Grade Ones does not confound or surprise me. I choose not to believe this reflects poorly on me for not knowing everything, but rather that it reflects well on the small humans for being such big thinkers. Many times, the process is as important as the content. As you’ll see below, nobody’s life will be saved by knowing these words or the stories behind them. But, I am optimistic that lives might be improved by learning how to learn. A couple of weeks ago, as often happens, two children brought almost the same question to me within about an hour. 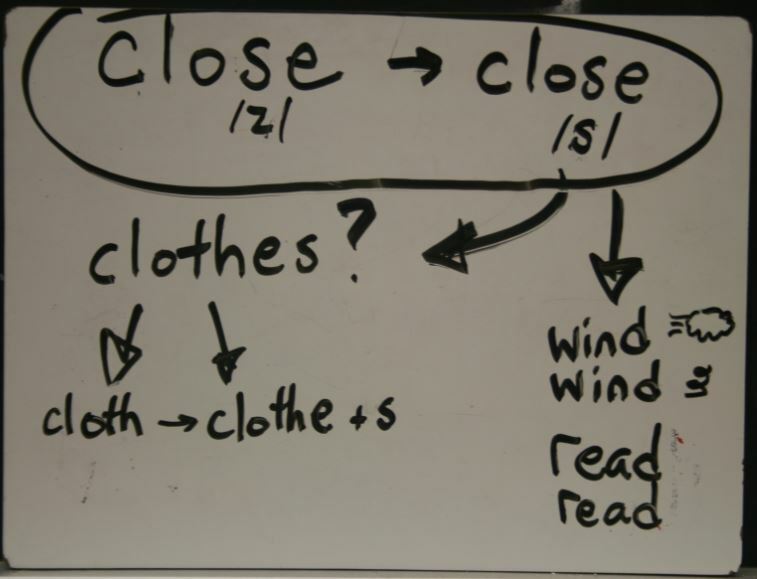 The question was, “We know about homophones [words that share pronunciation, but differ in meaning and spelling] and we know about homographs [words that share spelling and pronunciation but have different meanings], but what about words that have different meanings and the same spellings, but are pronounced differently?” Madisyn had found <wind> and <wind>, and then someone else–none of us can now remember who–turned up with <close> and <close>. We brought this interesting question to our whole class circle time (which led to the discovery of a very interesting homophone pair). I didn’t know the answer, and so shared our investigation on Real Spellers, a website devoted to such pursuits where I knew an answer would await. (You may follow that stream of discussion here even just to see how far such a discussion can travel). It turns out, these are called <heteronyms>. For many children, just having this conversation (and the one that follows) was a chance to highlight and reinforce their sense that different graphemes can represent more than one phone (e.g. see the <s> in the words at left). For others these may reinforce the accurate spelling of a given word. For others, understanding of the word is deepened. “oll korrect!” Hilarious! Ahmed and I read this together as best we could and chatted about this crazy history. We have shared it with the class. I am not sure they really get the story, but there is so much else we get out of this! We have seen that words can be played with. (I think they did at some level grasp the irony of us investigating the proper spelling of a word that it turns out is based upon a purposeful misspelling). We have glimpsed, again, that words have stories inside them, they have history, they came from somewhere. And, this can help us to understand these words. (Also, importantly, our teacher doesn’t know everything!) You may find one or two declaring “Oll Korrect”. I provided what I thought a passable explanation, but then a relatively new thing occurred: three children–Reyad, Jadis and Abdul, as I recollect–ran to grab our dictionary! The dictionary is a fairly new resource for us, as the entries can be a bit overwhelming in terms of vocabulary, but they are drawn to the secrets it holds. I don’t keep dumbed-down “children’s” dictionaries around, though, and you’re about to see why. It wasn’t until after a conversation with our friend Old Grouch that I thought about my own children’s often-enlarged tonsils, those mysterious, germ-absorbing glands in the back of our throats. I frankly would have said they looked more like raspberries, but I think “acorn” will do. And now, they’ve had another glimpse of the wonderful discoveries held in a good dictionary. (So-called “children’s” dictionaries, aside from having a woefully small collection of words, almost never contain the roots of those words. The publishers imagine children aren’t ready). Is the word <gland> core vocabulary, or one of the top sight words necessary in Grade One? Of course not. Do we need to know the history of <o.k.>? Not at all. Do we, though, want our children to be actively engaged with the richness of their language? More broadly, is it important that children learn how to pursue their questions down unexpected avenues? I think so, on both counts. Off to clean my driveway…er, finish my report cards!